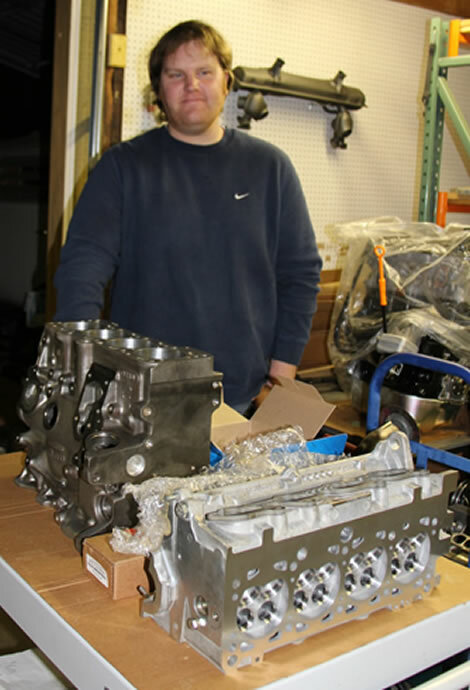 We choose a VW/Audi ABA block (a US version of the European ABF tall-deck block used in the mk3 VW/Audi 93-97 16V 2L cars producing 150hp) and Josh built a 2092cc 16V motor using a new balanced VW Audi OEM 95.5mm diesel forged crank, balanced VW Audi 159mm forged connecting rods, 83.5mm 11.5:1cr Weisco pistons p/n 6611M835 (11:1cr with 92.8mm stroke in a 9Aor PL block) and a balanced intermediate shaft.For those of you who are interested in the math of how this all works, the block height of an ABA/ABF block vs a 9A/PL block is 6mm taller (236mm vs 220mm) but the rods are only 5mm taller (159mm vs 144mm). 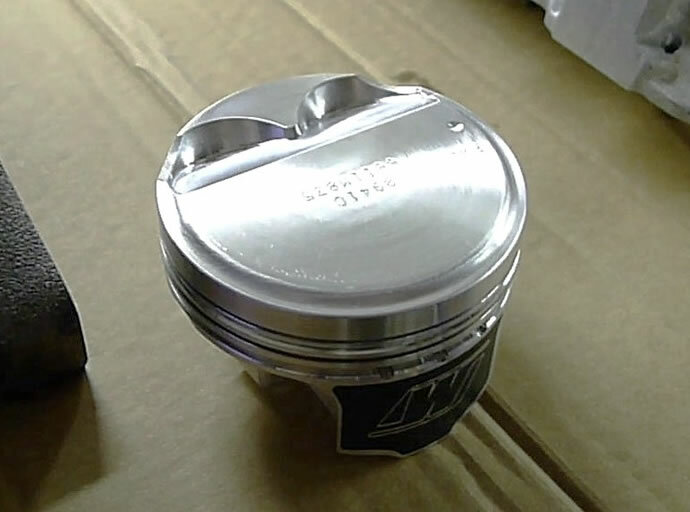 The stock ABA pistons have a 30.6mm compression height while the 9A/PL pistons are around 29.8mm. 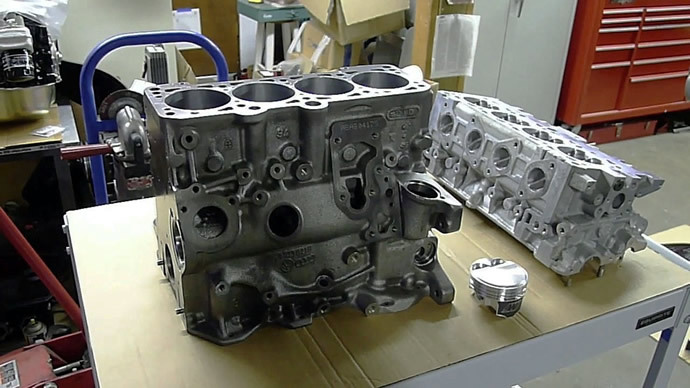 The 95.5mm diesel crank has a (95.5mm-92.8mm)/2 = 1.35mm higher lift but rods are 1mm shorter and the 9A/PL pistons have a 0.8mm lower compression height, so all you need to do is deck a used ABA/ABF block 0.45mm and you are right on the money - the increased stroke raises the compression ratio to around 11.5:1 from 11:1 in a 9A/PL engine using the Weisco pistons. 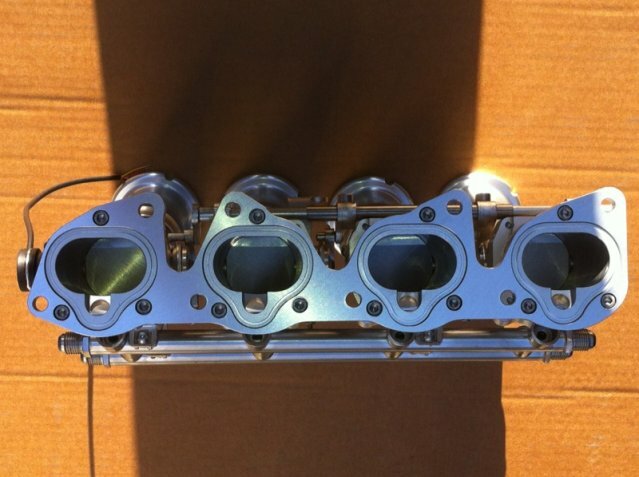 The heads are high velocity/turbulence 9A 16V (used in the mk2 VWs) with +2.0/0.5mm over sized 34.0/28.5mm valves/seats, 5.5mm super small intake stems, tapered guides, etc. - with a full 'stage 3' head treatment. 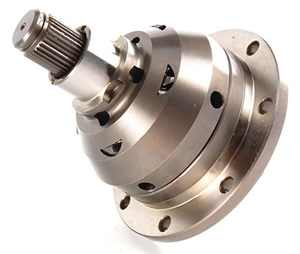 And the cams are TT 288 degree solid lifter (DLC coated) race profiles delivering great midrange torque of 165ft-lbs at 5000rpm and 240hp from 7200rpm to above 8000rpm. 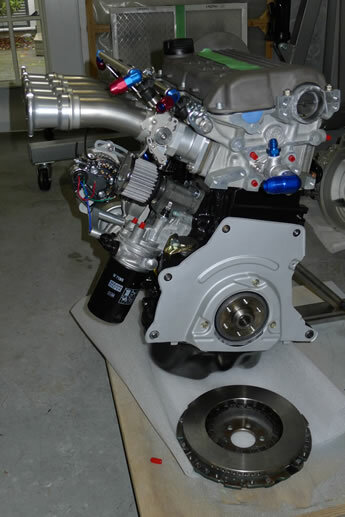 And to top it off we are using an individual DTH (direct to head) ITB intake system from AT Power, the Holly HP EFI system (with 8 injectors - 1 set for low RPM/part throttle, and the 2nd set for high RPM/full throttle), and a dry flow nitrous system to add mid range torque and 60hp at 8000rpm for a total of 300hp). To fit in the ATPower TBs and their long curved 280mm individual intakes, I am designing a custom radiator that tucks in behind the grill. 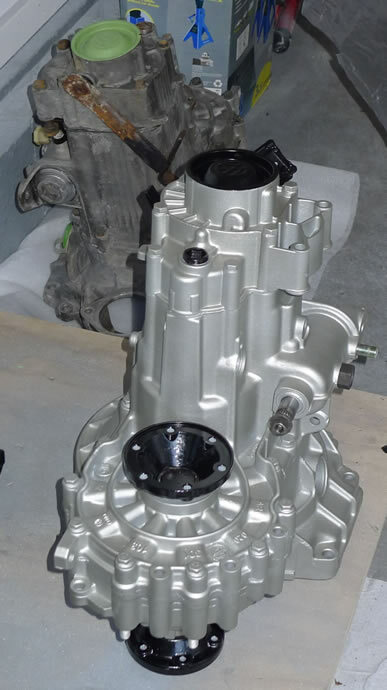 German Transaxle of America has built and delivered to Techtonics an 020 AGB 2Y (mk2 16V) close ratio transmission (same exact 3.45/2.12/1.44/1.12/0.91 1st thru 5th gearing as the original 020 2H trans but with a 3.67 final drive ratio rather than the earlier 3.94 ratio) with a Quaife differential and many other performance goodies. It will be shifted via a Techtonics shift kit. 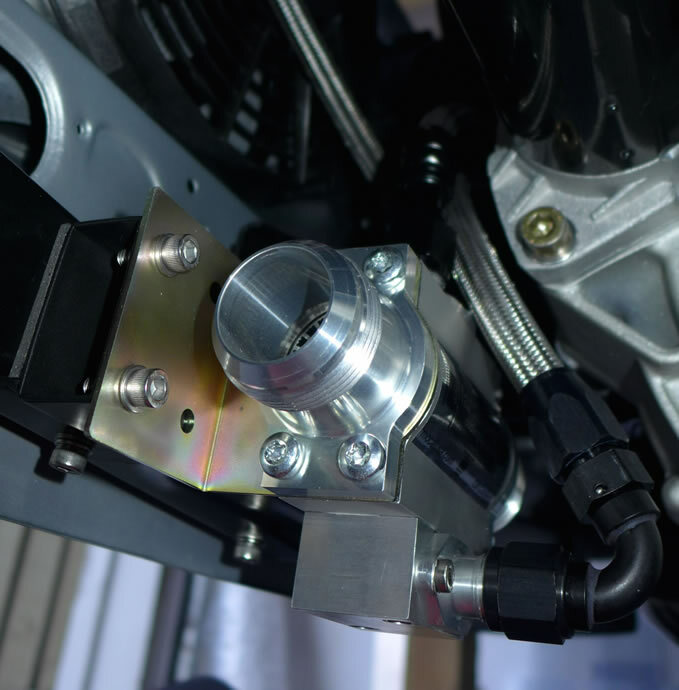 HD rubber engine/trans mounts have been selected to provide a performance oriented mounting system without undue harshness or vibration. 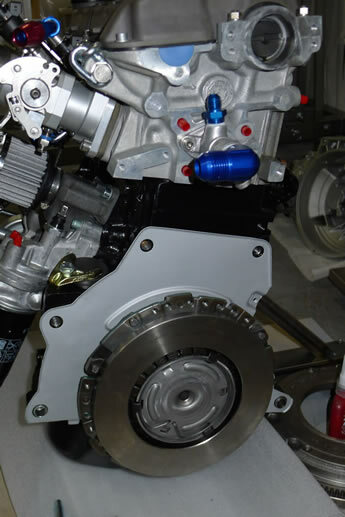 A high performance 210mm clutch with lightened flywheel will be used. 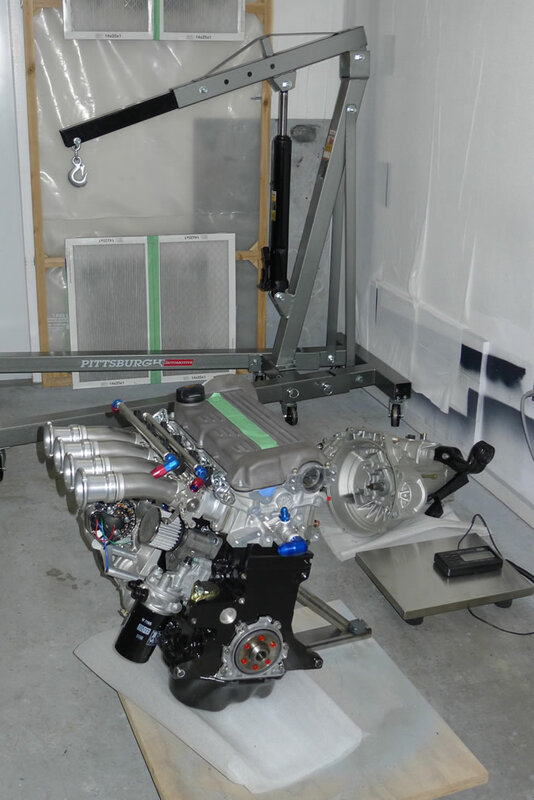 The car will cruize at 70mph at 3465rpm and will be at 150mph at 7500rpm in 5th gear. 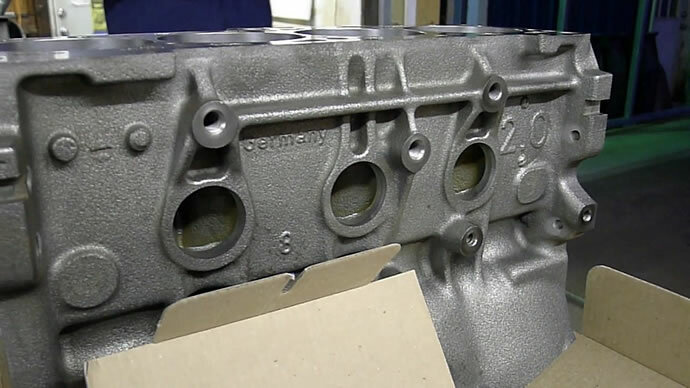 I have been noodling away on solving my problem of the ITB intake runners being too high (interference wit the hood). This problem was caused by not remembering that the ABA block is a lot taller than the earlier mk1 and mk2 blocks. 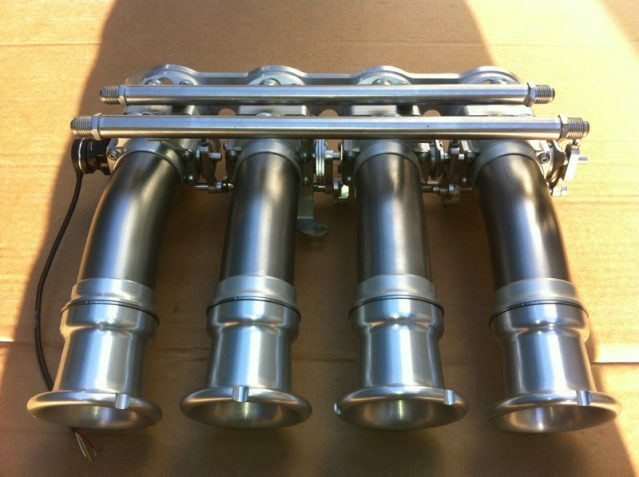 In fact my second injector fuel rail is close to hitting the hood as well! Anyway, I sourced high strength molding epoxy and built cardboard molds in the shape of the runners, which are 45mm ID, 48mm OD. I then mounted the epoxy molds onto steel plates and used threaded rods to allow me to apply bending pressure to increase the bend another 10 degrees or so - but those steel tubes would not budge 1mm, even with 500lbs of force. Eventually the epoxy 'caps' that I had made up snapped. 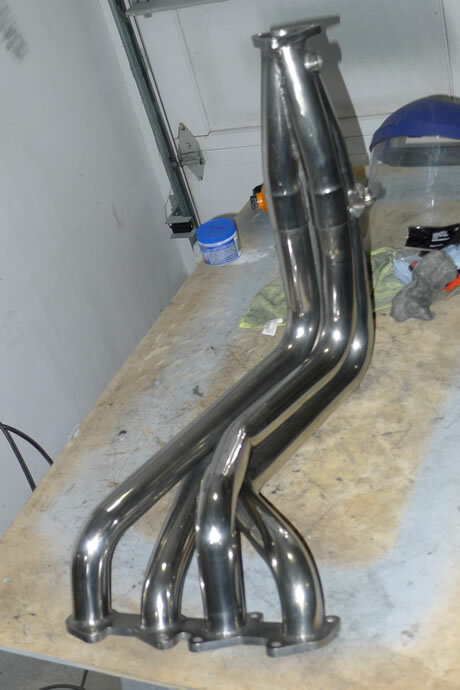 The good news is that today I finally found 48mm OD, 1.5mm wall thickness T304 stainless tubing, mandrel bent at 30 degrees, from the UK, which puts the intakes in the right position to clear the hood. I am trying to get an order placed along with another order from AT Power for another set of inlet/outlet caps for their ITB assemblies so that I don't have the try and un-glue the current intake runners (I did one today and made a mess of it as the glue, even when heated to 500 degrees, holds very strongly). 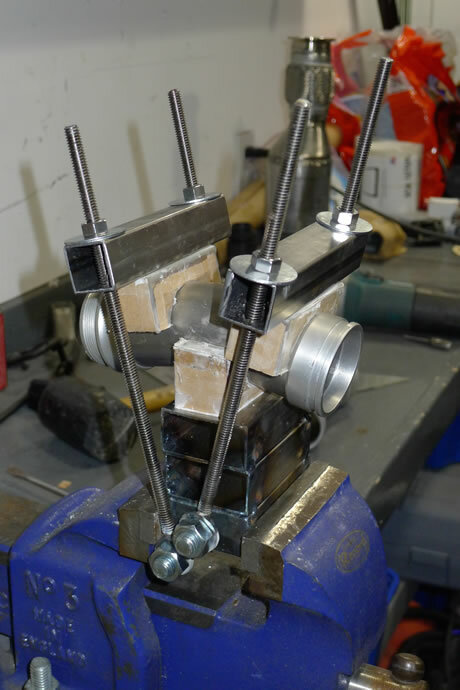 Over the weekend I setup the nitrous system properly on the bench with the custom high pressure air 'push system' and ran a series of linearity tests while pulse width modulating the trick new Quadranoid solenoid (from NOS Wizards in the UK). 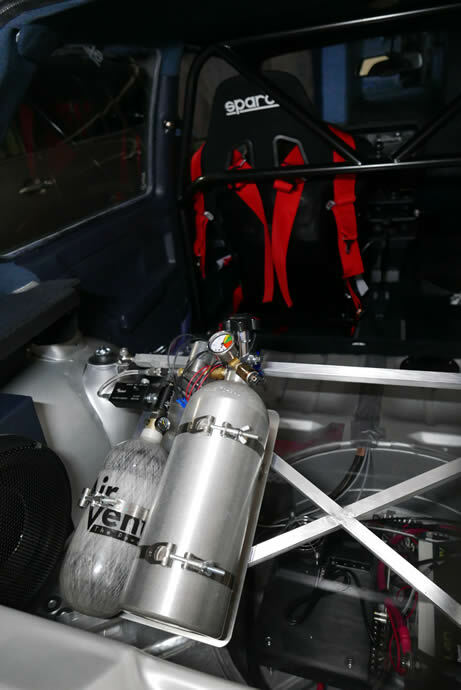 I consumed 20lbs of nitrous doing all of the tests and learned a lot about the optimum settings for that solenoid. 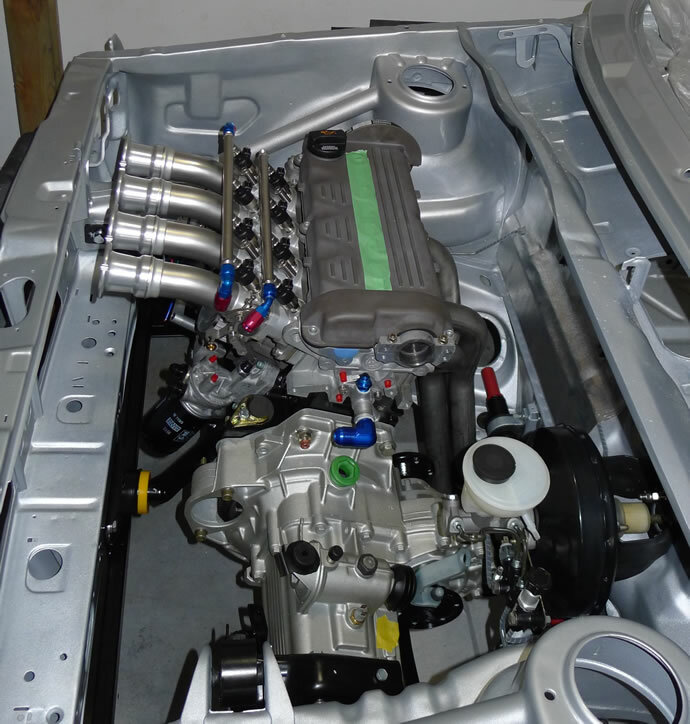 I don't want to run a lot of nitrous in my car as it could hurt my beautiful engine with its ultra precise tolerances (nitrous rapidly increases the combustion temperatures and in turn causes the pistons to expand, etc.). I only want a range of 15-60hp under computer control, not 100hp+. When I initially installed the 20hp jets, instead of seeing 20/40/60/80hp at 25/50/75/100% duty cycle, I got a range of 80-110hp using a frequency of 35Hz. 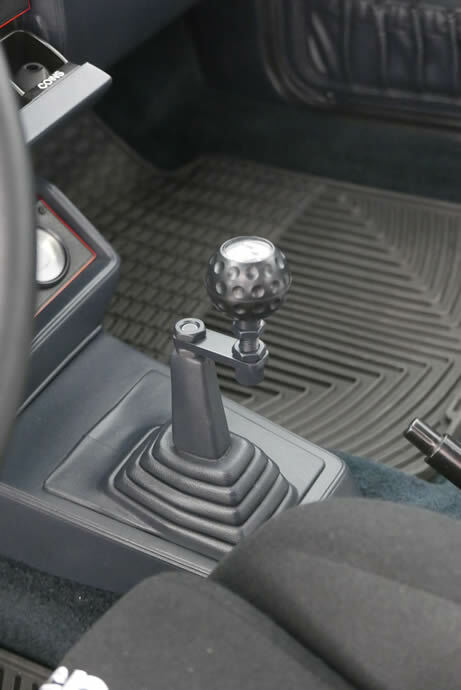 It turned out that while the Quadranoid is rated to 50Hz, it needs to have the plunger adjusted (a unique NOS Wizards feature) to a minimum height so the range of motion is dramatically reduced, and then it can be accurately controlled at high frequencies. 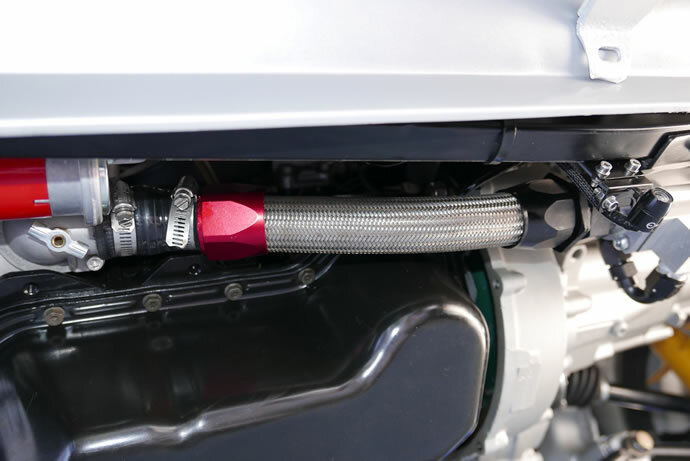 With the seat height at the stock full open setting the plunger just floats when modulated at anything more than 15-20Hz and that is too low of a frequency for my application (intake valves open and close 60 times a second at 8000rpm). 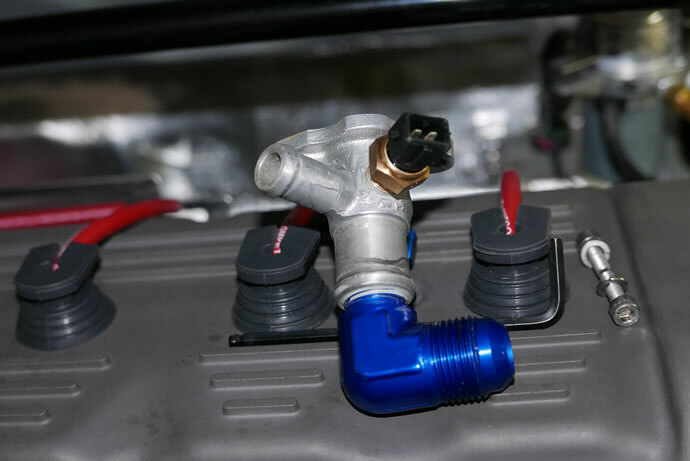 While 35Hz, which is the limit for my Holley Dominator ECU, is below the rate of intake valve opening at max rpm, I am feeding the modulated nitrous into a small chamber in the base of the Quadranoid, and then thru the distribution block/jets and then thru tubing to the intake runners: by the time the PWM controlled nitrous comes out the end of the tubes it is almost flowing smoothy - it has a slight pulsing to it but not a ton. I had been fighting the computer and sensors for the past several days but finally have it running now. Boy, it starts with authority and has a serious exhaust note to it (not really loud at all at idle but when the throttle opens it gets serious in a hurry). 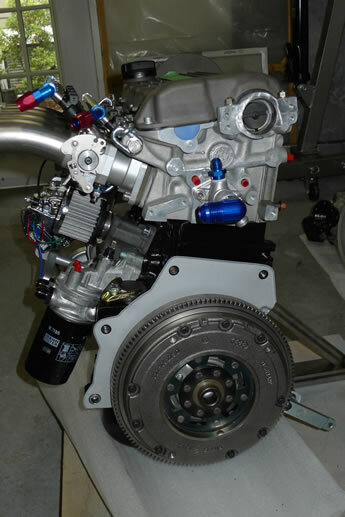 With the 288 race cams it will idle roughly at 900rpm but prefers to be closer to 1050rpm for smooth idle. I was expected worse ... seems that the ITBs saved the day. 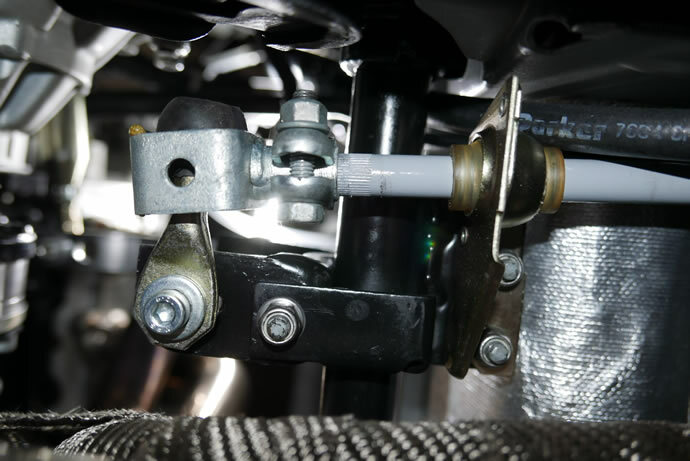 I had fabricated a hall effect sensor for the crank position 60-2 wheel from a late model mercedes but it turned out to not like the tooth width/depth and would give the computer erratic timing info at anything past 200-300 cranking rpm. I had to go back to the ABA inductive sensor (analog output) that the Holley dominator ECU accepted. Once that was out of the way I got correct timing for the ignition/firing of all plugs, and all other sensors were operational. But then it would fire and immediately die after transitioning from the cranking parameters to the running parameters. 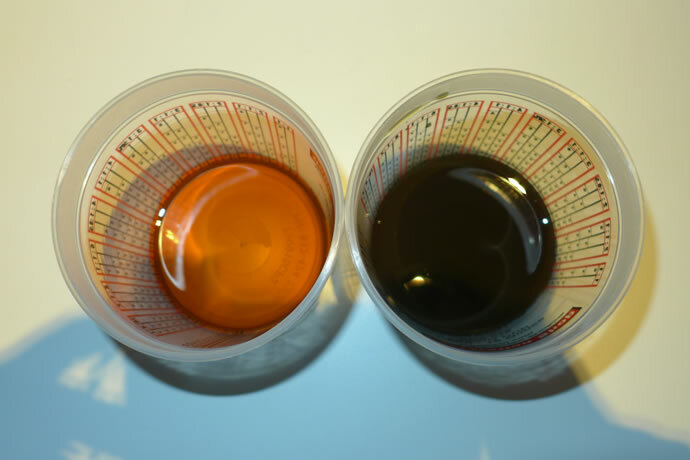 Turns out that Holley means zero fuel enrichment when programmed for 100% - I had it set to 'zero' and that means 'kill the fuel injectors'. Go figure. Anyway, I have lots of programming left to do as the AFR learning is limited to modifying the parameters a fixed % beyond the base tables, not learning all of the fuel tables from scratch. My tables aren't close enough yet to allow the engine to run beyond 2000 rpm without leaning out so I will be at it again tomorrow sorting out the tables. It starts nicely now, builds lots of oil pressure, the cooling system programming all seems to work nicely (the electric water pump speeds up and slows down as required, the cooling fans speed up and slow down as well, etc - all really trick/nice to see). 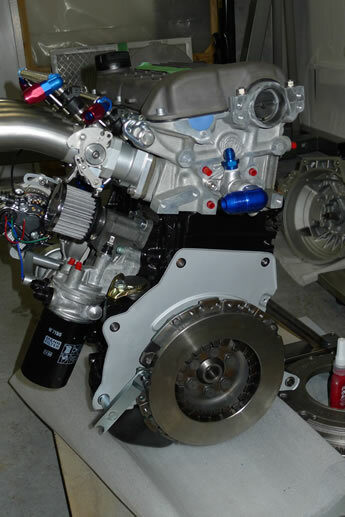 Boy a new engine smells a lot when it first heats up! 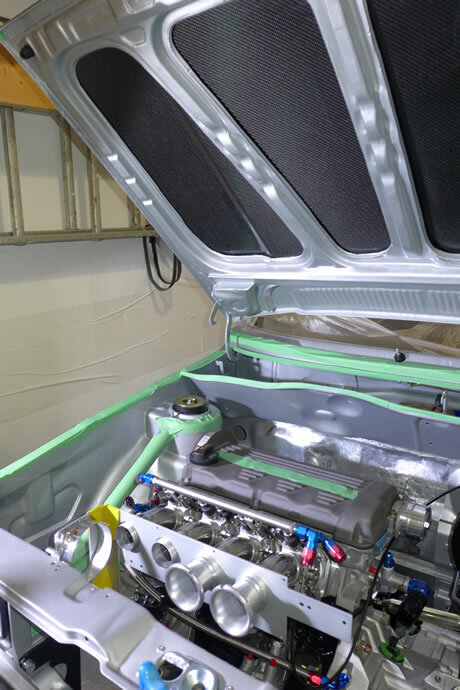 Tragedy has (almost) struck the ultimate GTI project. Cylinder #2 high mount 30lbs/hr injector failed (this never happens) in the ‘on’ position, filling the engine with fuel when I was doing ECU fuel table learning under load. 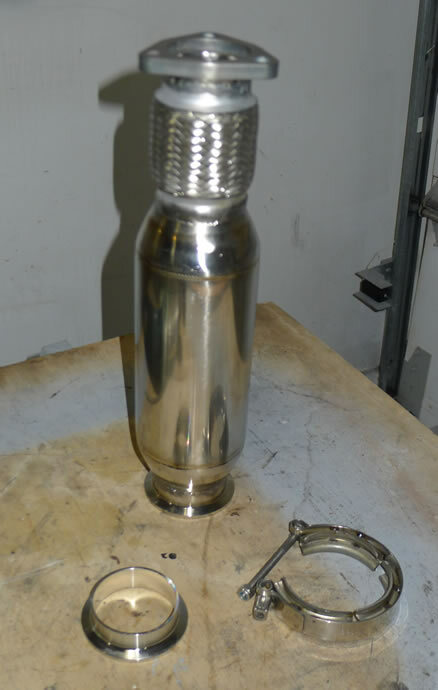 Potentially serious issue as fuel is not compressible and could result in bent internals. Freak failure. Never seen or heard of this happening before. Not an electrical issue. Simply an injector that decided to die and let the fuel pour out of it. I took the intake system apart, cleaned up and got the fuel completely out, etc. After sourcing a new injector, cleaning up the mess from dumping so much fuel into the engine, lubricating the cylinders with Sea-foam cleaner/lube, cleaning and re-installing the O2 sensor and Denso spark plugs, and bolting everything back together there were no more fuel leaks or sticking injector issues. I put more time into re-scaling the fuel and ignition tables, expanding the area from 70-102kPa MAP where the engine operates with the 288 race cams, tuning the idle IAC parameters, and also tuning the timing around idle and low-rpm part throttle, enabling idle stabilization via timing variation, programming in the acceleration enrichment tables, and otherwise leaning out the fuel table parameters to compensate for the low volumetric efficiency below 5000rpm, and after all of that the engine starts nicely, settles into idle smoothly, and has a very crisp throttle response, which is to be expected of an ITB setup. Now that this is all done and a lot of the basic A/F ratio fuel table tuning has been done/learning completed, I won't fire the engine again until the wheels are on the ground and the rest of the interior and wiring is basically completed. It has 180psi cold compression on all 4 cylinders and is broken-in enough for me not to worry about idling it. Now a few comments on the design decisions re. cam selection and other related engine components: We put these cams in at the last minute after previously deciding to build a set of race-ready heads and intake system with mild cams (a combination that pretty much achieves the best of both worlds) and then Josh (the engine builder) and I mused about first seeing what the potential of this engine was with the 288 cams, and then, if it was too much for the street we would swap in 276 or milder cams later on. I will likely also swap in softer sport H&R springs and have Bilstein re-valve the race struts for the same reason: first to demonstrate the full performance envelope of the project car and then bring it down to earth a bit with some de-tuning. 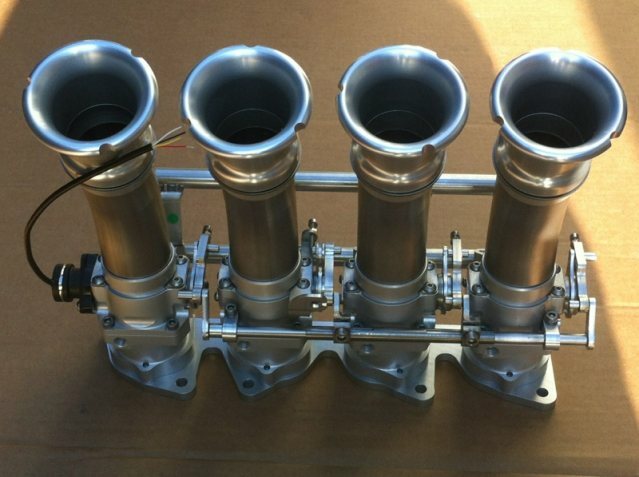 There is a birdie whispering in my ear saying that the 288 cams might actually be streetable simply because the ITBs allow for fairly smooth idle even with very low vacuum and the car is so light relative to the power output (likely 1800lbs and 250hp w/o nitrous) so the lack of low end torque may not be an issue - and it may help soften the throttle response at low rpms that otherwise might be over-the-top with the ITBs. I also have the option of having the nitrous come on below the torque peak at 2500-5000rpm to compensate and then shut off. 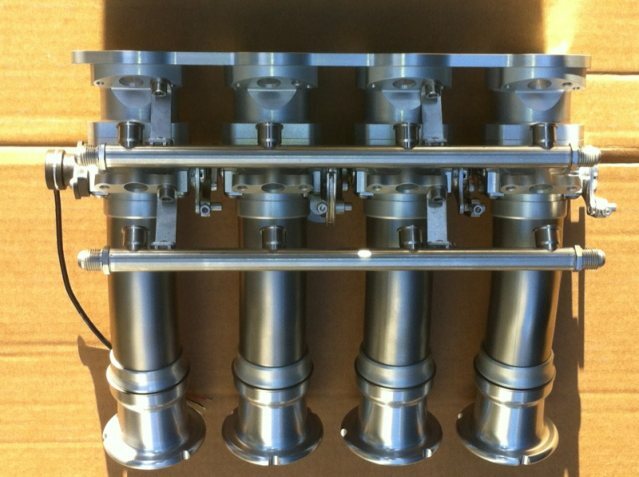 We have used this trick with big turbo setups to spin up the turbos and cut lag by 70% or more and then shut off the nitrous. 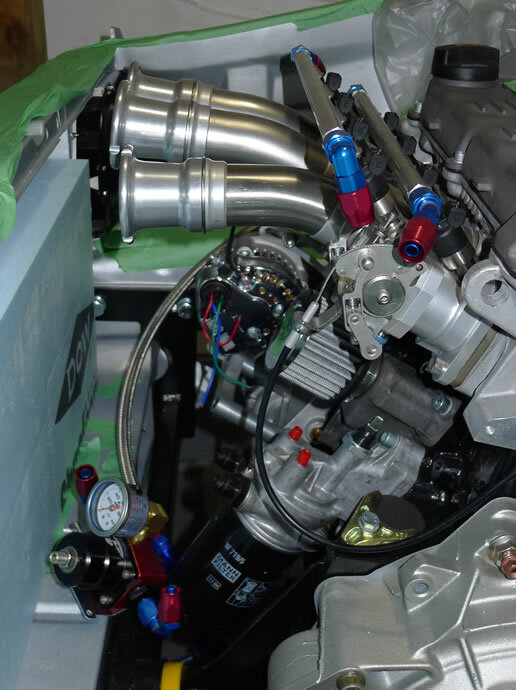 The ITBs are a related issue as the throttle response of this setup at low rpm is tremendous and I can only imagine how crisp and aggressive it will feel above 5500rpm when the cams are in their sweet spot. 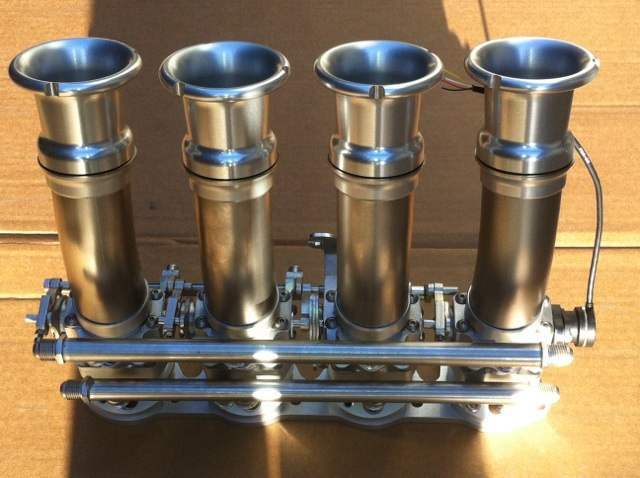 I like a crisp throttle but the problem I have with this engine is that the ITBs are huge (45mm but shaftless so equivalent to 48mm units) so essentially one throttle body can supply all of the engine air needs on its own and when those 4 blades all open together only a few % there is a dramatic increase in air flow. It reminds me of how my old 83 GTI felt when I swapped in a Weber 'Big Throat' TB - it got tiring after a while with the overly sensitive throttle - and that was with a 100hp/2100lbs car. I can only imagine how much more sensitive this project car's throttle response will be and how tiring it may be to have to be so careful with my right foot all of the time. We'll see soon enough ... fingers crossed.